Are you fast enough for Mailbird? Did you know that more people are reaching full email control with Mailbird? At least 85% of people who switched to Mailbird are actually reaching Inbox Zero more often. We challenge you to hit Inbox Zero at least once a day. This means clearing out your inbox in the most effective way possible using all the key features in Mailbird. Each day when you reach Inbox Zero in Mailbird, share it with the world via the Facebook and Twitter buttons. For many of you out there, actually tackling your email, staying productive and keeping your inbox clean is an overwhelming task. 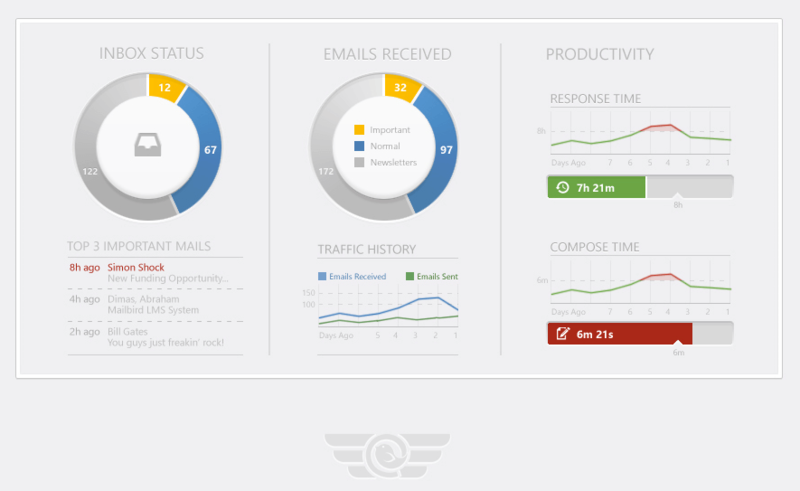 Many of you are simply too slow with managing email – which is why the Wingman feature planned for release in the 4th quarter of 2014 is going to be your key to success with email. Many of you have strayed far away from using email as an effective communication tool. Email is not your job, so stop wasting time with it. Keep that inbox clean, and get to work! For those of you who have unlocked the secret to proper email etiquette and management with the Inbox Zero philosophy, this “Are you fast enough for Mailbird?” challenge should be easy for you. We’d love to hear how you best tackle email, so help others out and give us your best email tips in the comments below. Bonus points [see details below] for those who also create a screencast and share the video link in the comments for your best practices in effective email management, because we know that many people out there could use some help in this part of their life. If you manage to hit Inbox Zero at least one time each day, don’t be shy…brag about your awesome-ness every time you clear out all emails using the Facebook and Twitter buttons. After one week we will look to see who has hit Inbox Zero the most, which will be based on your shares. 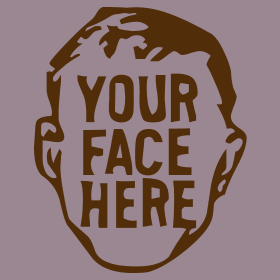 We will declare the ultimate email ninja winner who will be featured right here on our blog. Oh, but there is more! 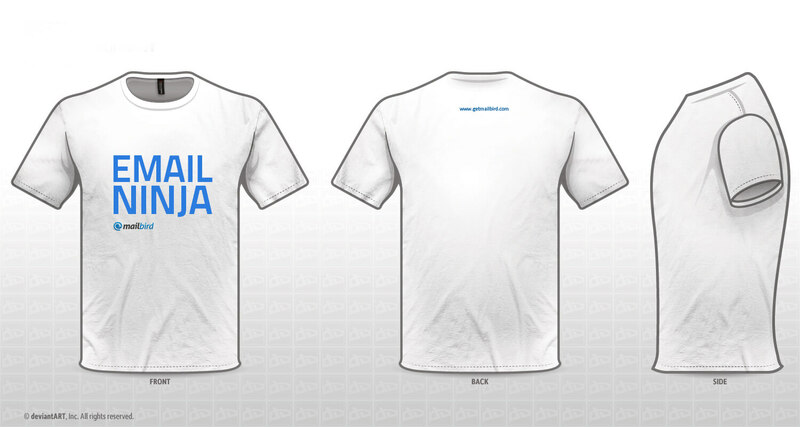 We’ll send you one of our badass Email Ninja T-shirts as a bonus if you reach Inbox Zero the most and create a screencast to show off your Inbox Zero email hacks. Again, all you have to do is share the video link in the comments below. 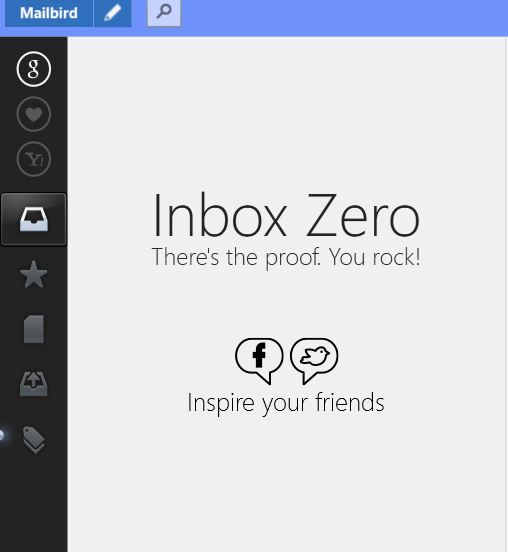 So show us what you got, get to Inbox Zero everyday and start telling the world about it. 7 thoughts on "Are you fast enough for Mailbird?" Is there a launch date for POP3? Cool, that´s what I´m waiting for. Mailbird #InboxZero challenge ends tomorrow! Did you reach Inbox Zero at least 2x each day this week? If so, did you brag about it to all your friends on Facebook or Twitter? And the winner is……..drum roll………Tomiță Militaru!!! How does Mailbird help Tomiță reach Inbox Zero so damn fast? The question now is….who will be the Inbox Zero winner next month? We are eager to see your screencasts of how you use Mailbird to reach Inbox Zero so fast. It’s Easter this Sunday, and boy do we have an awesome Mailbird update coming your way that helps you get to Inbox Zero even faster. “But how is that even possible?” you might ask. Well, you won’t want to miss the update this Sunday April 20th. 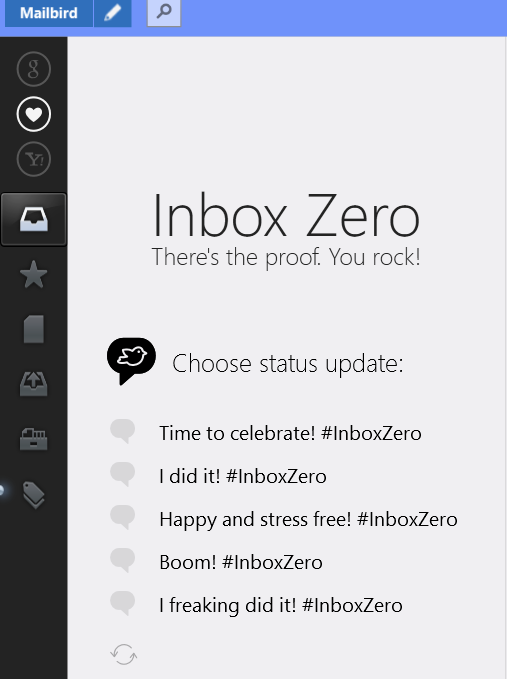 Be the first to get it and remember to update or restart Mailbird to get the latest email productivity hack.